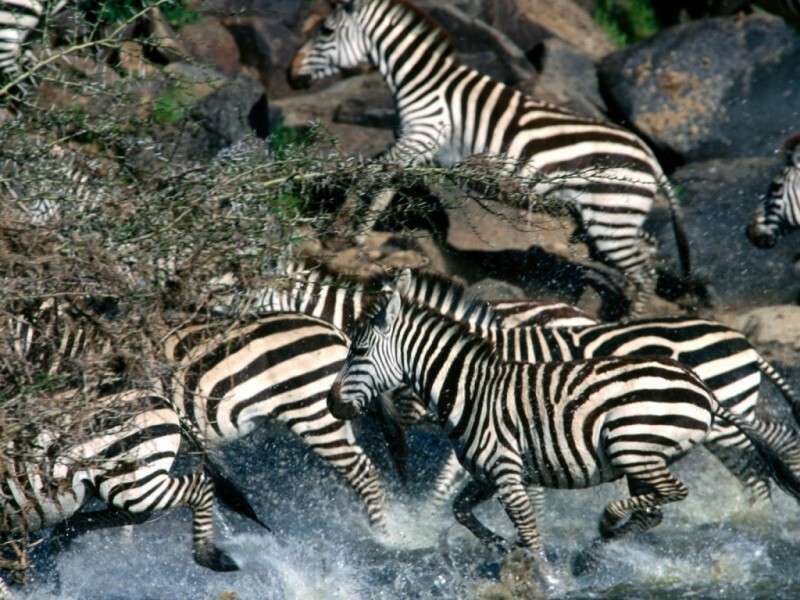 Each and every year, thousands of zebra migrate in search for better grazing pastures. Zebras are just one of the many of herbivores that migrate in search of food every year. The largest zebra migration is the annual migration of more than two million from the Serengeti to Kenya. This trip is about 500 miles and it includes a large circle that includes zebras, wildebeests, and many other animals as they move clockwise from the southeast. The time of migration depends on environmental conditions such as availability of water. Basically, when the dry season arrives around June, the grasses are exhausted and the zebra head to permanent water sources. They form columns which stretch for miles. Only some herbivores can do without surface water for long time periods and live on the forage that remains during the dry season. During November, when grazing is finished in the north and rains have resumed in the south, the animals migrate back to the renewed pastures. This is a very tough journey for the zebras. There are large predators such as leopards, lions, hyenas and cheetahs. These predators are attracted to the masses of easy prey. This migration loop also crosses the Mara and Grumeti Rivers, which are home to Nile crocodiles. The Nile crocodiles are very dangerous and also attack the migrating animals. The second largest zebra migration is called the Makgadikgadi migration, which goes across the Kalahari Desert. During this trip that mostly begins in March, zebras travel for about 350 miles to the Makgadikgadi grasslands for better grazing land. Despite the presence of a 150-mile fence that is erected to keep cattle safe from predators, the zebra migration still continues to be very strong in this area. Actually, about 20,000 zebra migrate here each year. Towards the end of each year, the herds return north.